Yoo Hoo, Mrs. Goldberg is the funny and surprising story of radio & television pioneer Gertrude Berg. Creator, star and writer (12,000 scripts!) of the hit sitcom The Goldbergs, Berg was a beloved trailblazer, the Oprah of her day. Berg’s blend of comedy and social commentary—with Jewish characters at the center—endeared audiences and made her an American cultural icon. From Aviva Kempner, director of The Life and Times of Hank Greenberg. From filmmaker Aviva Kempner (The Life and Times of Hank Greenberg) comes this funny and insightful story of radio and television pioneer Gertrude Berg, the creator, principal writer, and star of The Goldbergs. A popular radio sho w for 17 years, The Goldbergs became television’s very first character-driven domestic sitcom in 1949. Berg wrote 12,000 scripts for The Goldbergs (CBS’s number one show) combining comedy and social commentary—with Jewish characters, particularly matriarch Molly Goldberg, at the center. 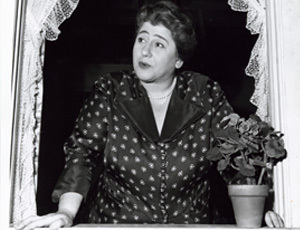 On the air, Berg was the endearing matriarch Molly Goldberg—kibitzing with neighbors across airshafts in the Bronx (“Yoo-hoo, Mrs. Goldberg!”). Off air, Berg won the first ever Best Actress Emmy Award, earned a Tony on Broadway, and charmed audiences on variety TV shows and through her advice column. Polls showed she was the second most respected woman in America, after Eleanor Roosevelt. When her co-star Philip Loeb was attacked by Joseph McCarthy’s blacklisting machine (a tragic witch hunt memorialized in the 1976 film The Front), Berg fought to save his career and The Goldbergs. Yoo Hoo, Mrs. Goldberg includes fabulous, rare clips from The Goldbergs kinescopes, and other period TV shows and films, including The Ed Sullivan Show, The Honeymooners, The Perry Como Show, I Love Lucy, The Milton Berle Show and The Marx Brothers. The film also features marvelous interviews with historians and fans, including Supreme Court Justice Ruth Bader Ginsburg, Ed Asner (The Mary Tyler Moore Show), Norman Lear (All in the Family creator), Gary David Goldberg (Family Ties creator), Andrea Roane (CBS anchor), Susan Stamberg (NPR correspondent), and many others. An unforgettable portrait of the most famous woman in America you’ve never heard of: the trailblazing American cultural icon Gertrude Berg. "An engrossing nostalgia bath... a window into a bygone world." "Kempner has done everything right... wonderful doc... a fascinating portrait of a worthy personality and her era." "A warm reunion with a beloved entertainer." 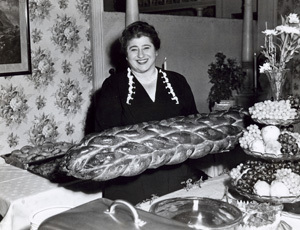 Gertrude Berg became a cultural icon against the backdrop of the twentieth century’s most difficult years for American Jews. Berg’s radio show, The Goldbergs, which she created, wrote, and starred in, premiered a week after the stock market crash of 1929. The show rose in popularity at the same time Hitler rose to power in Germany. She combined social commentary, family values and comedy to win the hearts of America. In 1949, she brought The Goldbergs to television, and it became the new medium’s very first character-driven domestic sitcom. She weathered yet another minefield of American history, Senator Joseph McCarthy’s blacklist, which had a devastating effect on the entertainment industry. Berg will be forever remember for the character she wrote and played for over twenty-five years, Molly Goldberg. Although she was “the Oprah of her day,” Berg is virtually forgotten today. She is the most important woman in entertainment you’ve never heard of. Gertrude Berg became an important public figure at a time when positive images of Jews, especially mothers, were rare in popular culture.